Item #CL-169: 1.25"x2"x1.75" Cloisonne monkey with white, brown or black background and multi-color floral design on a carved wooden base. 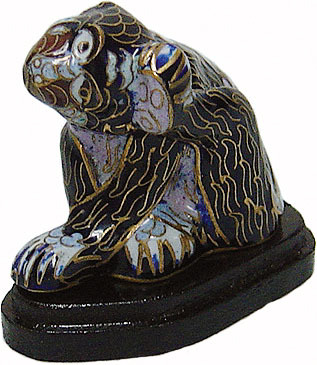 This playful monkey is captured in Cloisonne with his back foot scratching his ear. 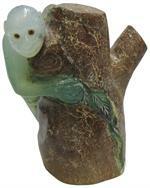 Item #CH-14: 1.5"x2"x3" tall, Chrysoprase Monkey with matrix on Brown matrix. 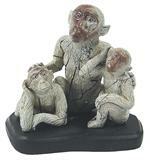 Item #MN-71-1: 5 1/2" tall Nature's Paint Brush Jasper Monkey Family on a 3/4" stand.